Tensor Tympani Myoclonus | Superior Canal Dehiscence Syndrome and Me! It seems I’m officially the Louvre of collecting strange middle ear problems. So, now, in addition to the Superior Canal Dehiscence Syndrome and Meniere’s Disease, I’ve also been diagnosed with Tensor Tympani Myoclonus. How ’bout them apples!? What is it? 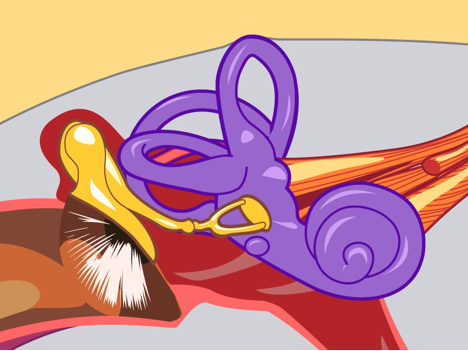 Essentially, it’s a muscle spasm in the inner ear that causes the eardrum to rattle. It sounds like a tympani drum striking inside my head. And it’s fairly constant. I should have knocked wood more often, because I had just been telling people how Betahistine combined with a diuretic had really helped me get back to feeling close to normal and productive. So this is an obvious bummer, and it makes sleeping without drugs kinda tough. How does it happen? Well, this muscle is designed to flex when we encounter sudden loud noises, or sustained noise, and works to dampen the sound to prevent ear damage. It’s kind of like a blink reflex protects your eyes from sudden bright light or flying debris. I saw Dr. Hain at Northwestern today, and we discussed possible causes. It could be that due to a Dehiscence on my left side and the resulting autophony symptoms, that this little muscle became overworked trying to protect me. It could also be that I’m too stressed, which they believe is a factor. So, I would caution everyone, but especially those with inner ear disorders, to protect their hearing in whichever ears they have that still work. I went to the Final Four a few weeks ago, wearing ear plugs, but that may not have been enough. He prescribed a muscle relaxer, then told me to try and chill. Which is funny. I’m planning to shoot a movie, trying to get tenure, and have two small children. So, relaxation is hard to come by. He also recommends the removal of the ventilation tube in that ear in case it is contributing to the irritation. I’ll check back in later with more details. In the meantime, knock wood if you are feeling well, and wear hearing protection. Here’s a link to a description of the disorder. This entry was posted in Updates and tagged betahistine, Dr. Timothy Hain, meniere's disease, Superior Canal Dehiscence, tensor tympani myoclonus, tinnitus on April 15, 2015 by Brad. Brad, I was just diagnosed with Meniere’s as well, and I have Tensor Tympani Myoclonus too – although I forgot to mention it to my doctor when I saw him…I will next visit. Anyway, for me it comes in waves, kind of like hiccups do…I’ll get it frequently for a few weeks and then go months without it. Weird. I also had BPPV on my surgical side, so I’ve had ’em all! This is for sure another bump in the road!! But we will keep on fighting and you always find a way to manage your new situations. Chin up babe! !